Following a slow start, the Pittsburgh Steelers were at 3-4-1 as they faced the Cleveland Browns on November 22, 1959. Head Coach Buddy Parker’s club had lost some close contests but upset the Giants in New York the previous week. QB Bobby Layne (pictured at right), in his twelfth year, was still a formidable competitor and leader and had a good group of receivers led by second-year end Jimmy Orr. HB Tom “The Bomb” Tracy was reliable carrying the ball and the defense tough and typically stingy. The Steelers had beaten the Browns in the season’s opening game. Cleveland was, as usual, a strong contender in the Eastern Conference in its 14th season under Head Coach Paul Brown. The Browns were coming off of five straight wins and at 6-2 were tied for first place with the Giants. 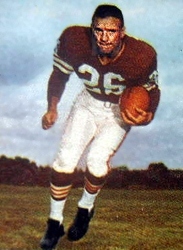 The ground game was the NFL’s best, led by FB Jim Brown and including fleet HB Bobby Mitchell, who had gained 232 yards against Washington a week earlier. QB Milt Plum was competent and had a good veteran receiving corps led by flanker Ray Renfro. There were 68,563 fans in attendance at Municipal Stadium. The Browns had the first possession and put together a drive that included two first downs, but came up empty when Lou Groza was wide to the right on a 48-yard field goal attempt. On Pittsburgh’s second possession, the Steelers drove 94 yards in 16 plays that extended into the early stages of the second quarter. It nearly came to an end twice, but a defensive holding penalty on a punt from the Pittsburgh 11 gave the visitors a first down and, forced to go into punt formation again, they got another break when Bobby Luna dropped the snap but managed to recover and ran 11 yards for a first down. 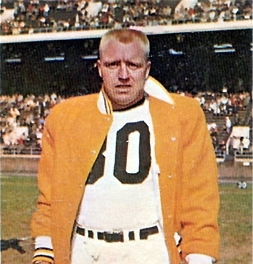 Jimmy Orr made an outstanding catch on an option throw by flanker Ray Mathews while double-covered by safety Junior Wren and DHB Jim Shofner for a 38-yard gain to the Cleveland six. Tom Tracy ran for a four-yard touchdown and Bobby Layne added the extra point for a 7-0 advantage. The Steelers put together another long scoring drive on their next possession, taking 17 plays to advance 72 yards. Tracy and HB Tom Barnett ran effectively and Layne had a 19-yard pass completion with a roughing-the-passer penalty tacked onto the end of it. The series again ended with Tracy (pictured below) running for a TD, this time from one yard on a fourth down play. Down by 14-0 with less than three minutes remaining in the first half, the Browns advanced 80 yards in response. It took just five plays, the biggest a run by Jim Brown that covered 40 yards and the last a pass from Milt Plum to Ray Renfro for a 32-yard touchdown. Groza’s attempt for the point after missed to the left and the halftime score was 14-6. The Steelers attempted to add to their lead in the third quarter, but Layne’s 31-yard field goal try was blocked by DE Paul Wiggin. Cleveland had a shot at a field goal late in the period but Groza was again unsuccessful, this time from 48 yards. The Browns appeared to take control in the fourth quarter, scoring two touchdowns. Plum passed to Renfro for a 27-yard TD and Groza added the point after. Shortly thereafter Plum, not known for his deep passing, went long for Renfro once more and it resulted in a 70-yard touchdown, with Groza again successfully converting. Cleveland was ahead by 20-14. Meanwhile, Cleveland’s defense kept Pittsburgh in check on offense but, behind by six points and with time running down, the Steelers put together a scoring drive after regaining possession at their own 17 following a Cleveland punt. Layne threw to Orr for 17 yards and a roughing-the-passer penalty on the Browns added another 15. Another pass was incomplete, but Layne then connected with Orr again for 19 yards, and while the receiver fumbled at the end of the play, Mathews recovered to maintain possession at the Cleveland 33. Tracy ran up the middle for 16 yards and, two plays later and with 40 seconds left to play, Layne threw to end Gern Nagler under the goal post for a 17-yard touchdown that completed the 82-yard, six-play series. Layne added the all-important extra point. There was still a chance for the Browns in the remaining time, and Plum passed them into Pittsburgh territory, but Groza missed a 49-yard field goal attempt on the final play and the Steelers came away winners by a final score of 21-20. The Browns had the edge in total yards (387 to 338) while Pittsburgh had more first downs (21 to 16). Running the ball more than twice as often as Cleveland (47 carries to 22), the Steelers led in rushing yards (182 to 126) while the Browns, playing catch-up for most of the game, had 261 net passing yards to Pittsburgh’s 156. There were no turnovers and, while there were just seven penalties (four on Cleveland, three on the Steelers), the Browns and their supporters complained about the timing and effect of some of the penalties assessed on them, in particular the roughing-the-passer calls that sustained critical Pittsburgh drives. Bobby Layne completed 12 of 20 passes for 126 yards and a touchdown with none intercepted. Tom Tracy rushed for 99 yards on 24 carries that included two TDs. Three receivers had four catches apiece for the Steelers, with Jimmy Orr gaining 86 yards on his and Gern Nagler compiling 63 yards plus the game-winning TD. Milt Plum was successful on 17 of 29 throws for 269 yards and three touchdowns and also had none picked off. 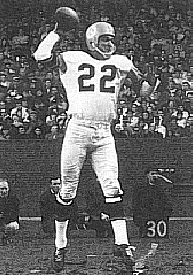 Jim Brown gained 111 yards on 15 rushing attempts, although Bobby Mitchell was held to just 15 yards on 7 carries. Ray Renfro (pictured at left) accumulated 161 yards on 5 pass receptions, three of which went for TDs. End Billy Howton also caught a team-leading five passes, for 77 yards. It was a rough day for Lou Groza, who missed three field goals plus an extra point. The second straight upset win on the road evened Pittsburgh’s record at 4-4-1 and the Steelers won again the next week, and twice in their last three games, to finish fourth in the Eastern Conference with a 6-5-1 tally. As for the Browns, the loss dropped them out of a tie for first place in the Eastern Conference and was the first of three straight that saw them fall out of contention and end up tied for second in the conference with Philadelphia at 7-5. Bobby Layne ranked second in the NFL with 20 touchdown passes, although first with 21 interceptions, and his 142 completions and 1986 yards gained placed fifth. He was named to the Pro Bowl, as was Jimmy Orr with his 35 catches for 604 yards (17.3 avg.) and five TDs. Tom Tracy was the NFL’s fourth-ranked rusher as he gained 794 yards on 199 carries (4.0 avg.) that included three touchdowns.